This door is supplied pre-finished with a closed pore clear satin lacquer. With attractive flat faced raised mouldings, and deep profiled panels, the door oozes quality. This Madrid Fire Door has engineered Oak construction with MDF core panels, and engineered-timber core stiles and rails. Madrid Glazed Oak Fire Doors are manufactured from engineered door components which can include MDF, particle-board and laminated timber. Madrid Doors are pre-finished with a closed pore clear satin lacquer. Mendes Madrid Timber Fire Doors have a copy of the manufacturer's instructions included in the packaging. - It is the purchaser's respon­sibility to check the suitability of this Madrid Glazed Oak FD30 Fire Door and it's Certi­fica­tion, in conjunction with Intumescent Strip, the Fire-Door Frame with Architrave, the Fire-Door Hardware and the Fire-Door Situation of Use. 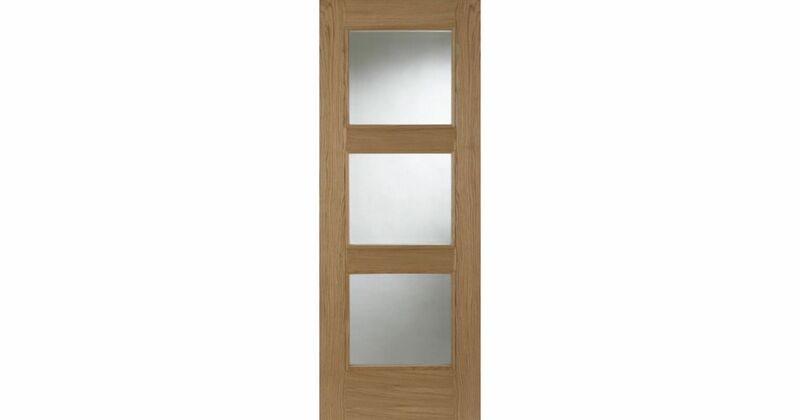 - We cannot exchange Madrid Glazed Oak Fire Doors after order - Mendes Madrid FD30 Glazed Oak Fire Doors are supplied as a Special Order. - Once ordered, the manufacturing process will begin, and there can be no alteration or cancellation. E. & O.E. see T&C - We do try to keep prices and specifi­cations of Mendes Madrid Glazed Fire Doors correct, but mistakes can be made!